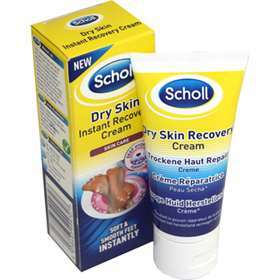 Scholl Dry Skin Instant Recovery Cream 60ml contains an innovative Deep Hydrate Formula that exfoliates dead and dry skin cells. By allowing special moisture boosters to penetrate deep into the skin, Scholl Instant Recovery Cream promotes effective moisture levels in the upper layers of the epidermis. Exfoliates dead and dry skin cells. Promotes effective levels of moisture. Velvety soft and smooth skin for 24 hours. Great healthy looking feet after 7 days. If the skin on the feet loses moisture it becomes damaged, rough and flaky. This can leave an unsightly appearance and feel rough/coarse to touch. Aqua, Glycerin, Urea, Ethylhexyl Palmitate, Isopropyl Myristate, Cetearyl Alcohol, Glyceryl Stearate SE, Sucrose Distearate, Petrolatum, Stearic Acid, Propylene Glycol, Sodium PCA, Sucrose Stearate, Cyclopentasiloxane, Lactic Acid, Hydrolyzed Wheat Protein, Allantoin, Diglycerin, Sorbitol, Lysine PCA, Polysorbate 60, Xanthan Gum, Parfum, Disodium EDTA, Phenoxyethanol, Methylparaben, Propylparaben, Ethylparaben, Butylparaben, Alpha-Isomethyllonone, Benzyl Salicylate, Citronellol, Geraniol, Hexyl Cinnamal, Hydroxycitronellal, Hydroxyisothexyl-3-Cyclohexene Carboxaldehyde, Linalool. Apply Scholl Dry Skin Instant Recovery Cream daily on clean, dry feet. Gently massage into the skin, in particular in the area of dry skin. Do not apply to damaged, inflamed or broken skin. Stop using Scholl Instant Recovery Cream if it disagrees with you.